Spell it with fabric…Moda Blog Hop..
Moda has also given me some great prizes to give away…as well as a kit for our mini quilt from Primitive Gatherings… so please comment on this post and you will be entered to win….we will pick a winner March 5…I will be back from a teaching gig on the 3rd and need a day to get my stuff together and then we will post a winner…We have 5 prizes total…good luck! I also want to take this time to talk about my new line…which our give-a-ways are from….Homestead Gatherings….Deep Reds, Blacks, Browns and Greens along with Tans paired with all the previous colors on them….I think this line is my favorite so far…I love the little accent piece with the house..It comes tan/red, tan/black and black/dk tan…. What if everyday was a holiday?…… I’d be really Pfat!!! Do you have a quote or motto you live ( or work) by? Something I like……whatever you do…do it the best!!! Somewhere I have been……I am teaching on a quilting cruise right now…I can’t think of a better place!!! Somewhere I want to go….I love being HOME at our Lakehouse!!! Next Post Spell it with Fabric… blog hop winners! I absoluitely LOVE your bfabric and designs! I love the mini alphabet quilt. The fabrics are beautiful. I love anything you design! Thank you for the chance to win some of your gorgeous fabric. Thank you for the opportunity to win some of your beutiful fabrics. I really like your prints. Lisa, All I can say is WOW to the fabrics the quilts and the darling mini sampler. You are amazing!!! A great baby shower gift idea !!!! Beautiful, we have a couple of new babies coming to our family this summer, this would be perfect!! I love everything you do. The fabric and new quilts are awesome…will have to place an order. Happy Cruising…hopefully it is nice and warm!! Your rendition of the alphabet quilt is cute – I’ll be checking out those kits in your online shop. Your creativity is beyond compare – I have enjoyed every project I have made from Primitive Gatherings. Thanks for all of the fabulous ideas as well as a chance to win! I love the mini quilt — what a great gift for a baby or child. The Alphabet letters made a great Baby Quilt. I love it. The new fabric line is awesome. Thanks for a chance to win. Love your Alphabet quilt. I can hardly wait to see your new line of fabric. Hope to see you at the Lancaster quilt show. Your new line is great…as usual. I love the alphabet quilt, it would be perfect for my first grand-daugther. it would be her first of many Primititve Gatherings quilts. Enjoy and relax on your cruise! Love the new fabric line. Enjoy the cruise and time away from our Midwest winter! Very beautiful Alphabet quilt, thanks for the pattern. Love, love, love this little quilt. We are expecting a new little granddaughter in June and this will be a fun quilt to put together for her. Your new fabric line is great, I will be in the Menasha area in March and look forward to getting back to your shop. I might just have to rent a grandbaby so I can make that adorable alphabet quilt!!! Too cute!! The colors of the mini alphabet quilt are great! What a great idea for a baby quilt! My mom, daughter and I will be visiting your shop later this spring – CAN’T WAIT! Love your little alphabet quilt. Thanks for a chance to win. The alphabet quilt is so cute! Thanks for sharing. Lisa, Love all your fabrics and like always your designs are awesome. Alphabet quilt is darling. The little quilt is adorable. Have fun on your cruise!! Love primitive gatherings. Would love to make the mini quilt. You are sew creative! Love the ABC quilt! I LOVE the KIT and of course your FABRIC!!!!! You are such an AWESOME designer and you inspire me sovery much. Thank you for this great opportunity. I love your new line, the little houses are adorable..the alphabet quilt is a winner too!!! I really like your smaller sized alphabet quilt. We have a new 6 day old (first) great grandson that it would be perfect for. I also like the blue, red, white and green quilt which I think would be perfect for Christmas-X-masey without being “over the top”. Enjoy your cruise-this is a wonderful time to be on one! Awesome alphabet quilt Lisa and your new fabric is beautiful! Thanks so much! I love your petite version. So cute. You continue to amaze me with all your designs, totally amazing! Love everything and thanks for all you do. Love all the new quilts, but especially the alphabet quilt!! Wish I knew someone having a new baby so I could make it for them!! I love the little alphabet quilt made from your new line. I would have had a hard time making one letter as well!!!! 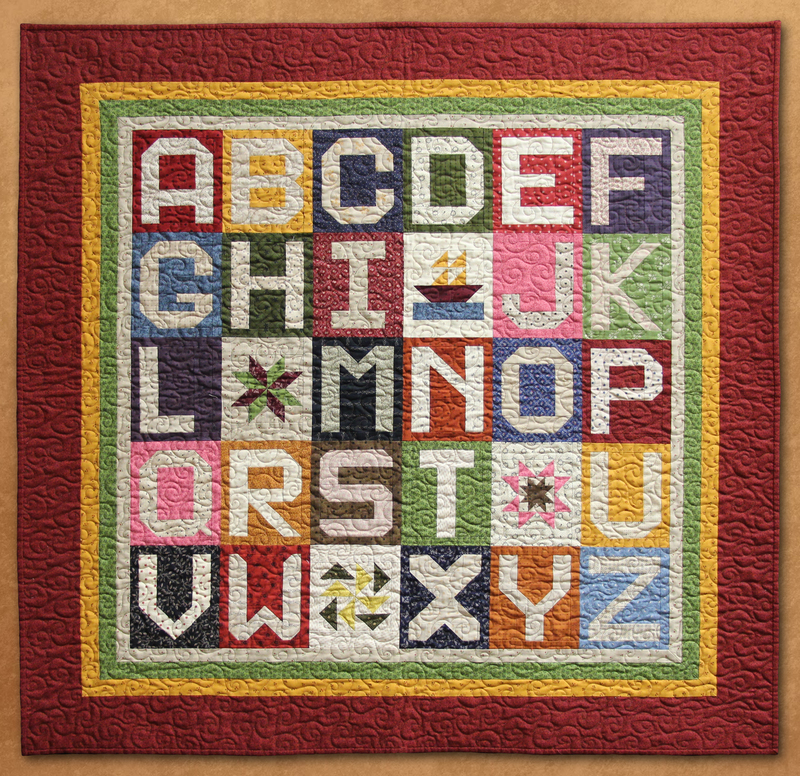 The mini alphabet quilt is just beautiful. I loved all your quilts in the blog. Thanks for sharing them with us. I love your new line…another must have for me! The Homestead pattern is calling out my name as well. Your little alphabet quilt is so adorable. It would be great to make up and keep on hand for the next baby shower to come along…great for either a boy or girl! I’d be thrilled to win anything, as long as it’s something you’ve designed. I’m a huge fan! I LOVE your new line! The houses are so sweet! I love the smaller letters in your alphabet–gonna have to buy that pattern for sure! The new line is great and I really like the alphabet quilt too. This quilt is adorable and the fabrics are fabulous. I can’t wait to see them in person. Your work and fabrics never cease to amaze me! Simply love them all Lisa/Primitive Gatherings! Adore the little alphabet quilt. Your fabric designs are lovely. great idea reducing the size-fabrics are really spring like and pretty. Home Sweet Home! Hope you had a great cruise. I like the smaller size and a kit would be awesome. Love the new designs and fabric. Another pretty fabric line! Looking forward to seeing it! Cute alphabet quilt. Love your new prints. Sweet alphabet quilt! Would love to win anything. You are sooo creative and busy!!! Great new line; I look forward to seeing it in person. The alphabet quilt is adorable – each letter is fab though your “P” is Perfect!! Thanks for a chance at the giveaway. On a cruise….you lucky dog! What a wonderful idea a miniature alphabet. Can’t wait to get all the letters so that I can make my own quilt for my granddaughter. Love your new fabric. Can’t wait to create with it. Love the layout of your beautiful alphabet quilt — expecially the clever positioning of the fill-in blocks! I love the little alphabet quilt and your new fabric line is beautiful! Thanks for the chance to win! Love the little alphabet quilt and the new fabrics are beautiful! Thanks for the chance to win! Can’t wait to see the new fabric line! And the new patterns look wonderful! That little alphabet quilt…adorbs! And I really like the new line. I could stay home and be happy all the time ~ of course I would need to venture out for fabrics! What a fabulous quilt that would be perfect for my daughter’s pre-K class. She has been so wonderful to all the kids this year, I’d love to stitch this up for classfroom. The mini alphabet quilt is just darling! What a great way to use these letters. The new quilts for the new patterns are so pretty. I especially love the house quilt with the little sheep and what appears to be about a milling little HST’s. Great stuff! Hope the cruise was the best! I’m loving seeing all the different fabrics…this has been a lovely hop. Thank you. Cute! Cute! Quilt. Would love to have! Thanks for all the wonderful things you have and the work you do. I always look forward to your blogposts…and this is no exception! Your alphabet quilt is outstanding…absolutely love it! You always have so much eyecandy for the quilter…and your new fabric is one that I am going to have to have. Thank you for all you do…Moda is lucky to have your. Have a Happy Day! Wow, the new fabric line is so cool! Love the saltbox houses. Have fun I hope its a success! I love your mini alphabet quilt—so cute! And your new fabric line is also my favorite! I love HOME and this fabric looks perfect for so many projects. Love that hospitality quilt too! Have a great cruise! I love this new line of fabric. Hope you have it in time for the Atlanta quilt Expo. I also like all the quilts you have made up in it and plan to make at least one and maybe more. I also like the alphabet quilt..so cute. It is a great quilt and can be used by anyone…not just kids but it is perfect for a child. I love the mini quilt and I love all your fabric! Love the mini alphabet! Great idea!! Your new line is very pretty. I love your alphabet quilt. Your new line of fabric is gorgeous. Yea for 1/2 size. I was planning to draft them myself- so THANK YOU for doing the work for me!!! These fabrics are gorgeous. Especially love the background on that darker shaded bed quilt with the feathered quilting! What a great giveaway Lisa!!! I’m thinking the same as you as far as using all the letters, I want to make a baby quilt using all the letters too!!!!! Please pick me, your fabrics can make a quilt to keep us warm here in NJ. Absolutely love this! I have two nephews who would love if Auntie made one!! Hi Lisa. I love anything that you make but I especially have my eye on Homestead, that is my all-time favorite because I love Willow trees, we do not see enough of them. I already have used your Homestead Gatherings mini charm pack to make a small throw pillow and love how they go together. Thanks for a fabulous giveaway. Oh and thanks for your flash sales, I have taken advantage of one of them already and look forward to seeing what is next every week. You sure keep yourself busy! Beautiful work and beautiful fabric or should I say pfabric! I love the Christmas on the Priarie quilt and the one with the sheep on it. Love the new fabrics! cute letters quilt. Love the little ABC wall hanging. Need to make for my grand daughter. Thank you! Lisa, Love your designs – and really enjoy your blog. Your passion and talent come across in everything you do. I took a class from you a couple of years ago and really enjoyed your enthusiasm – and of course I now have a new addiction – wool appliqué. Hope the cruise renews and encourages you! Wow, just when I think it couldn’t get any better, you do it again. I am working with Floral gatherings right now. Love Homestead Gatherings and the mini alphabet quilt is the absolute best. Cute little alphabet quilt, but I really, really love the new ones with Homestead Gatherings! Love this line!! Thanks for the block pattern and the opportunity to win. I love your little alphabet block quilt. I also love you new line of fabric and the quilts are gorgeous. Have fun teaching. Again, you have outdone yourself the mini alphabet quilt is Perfect. Love that it is a mini. Hope you are enjoying the cruise, a welcome relief I am sure from the winter weather. Thanks for sharing your goodies with us. I love the quilt. Your new line of fabric is beautiful ! Beautiful quilting and so many triangles! I love your little mini alphabet quilt and will keep it in mind for the next grandchild. Thank you for the idea. Your new line looks great, I am eager to see it and purchase some. Your smaller alphabet quilt is great! Makes me want to do one too, Would love to win!!! Your new fabric line looks great! Thanks to you and all the other quilt stuff on line that’s helping me get through this winter from H _ _ _! The fabric looks fab! Thanks for the giveaway. What a wonderful quilt to use in an elementary classroom. The kids would love it and it would be very useful. I really like the little alphabet quilt, especially the fabrics you have chosen. Of course, the little patchwork blocks mixed in made it perfect. Very nice! Wow, lots of great new eye candy in this post! Love Homestead and your new line. Love all your fabrics and the alphabet quilt !!!! I am a HUGE fan of all things Alphabet!! Love the colors of your new fabric line and please enter me in your drawing. The mini alphabet quilt is so cute! Your new quilts are gorgous, Lisa. I am especially in love with Hospitality. Your new line has a richness I am drawn to and I LOVE that mini alphabet quilt. Really love your new line, wish i had your creativity and could design like you, just beautiful. Love the new line. Thanks for the chance to win. Phantastic mini quilt!! I love your fabrics. WOW!!! How do you keep all that creativity under control? Do you ever sleep? Thank you for sharing your wonderful talents with us, so very appreciative! You make our quilting look good!!! Love the mini alphabet quilt and all your other designs!! Love the colors in Homestead!! First of all, I must comment on the photo of you…..you look beautiful and happy! Hope your cruise is all you hope it will be and all goes well. Your mini alphabet quit is such a great idea and would be such a wonderful teaching tool for the little ones. They could use it as a blanky and learn from it as well. Happy sailing. Love the alphabet quilt, would love to make it for my granddaughter!! Nice meeting you in Phoenix and can’t wait for you sunflower quilt!!! The alphabet mini quilt is darling. I love it! OMG, Christmas on the Prairie, I love! And the fabric with There’s No Place Like Home, love that too. Keeping my fingers crossed for one of your great giveaways. Happy sewing, all! I absolutely adore the mini alphabet quilt and know of a little girl who could use it as a reference when it is time for her to learn her ” A, B, C’s”. My goal is to make at least one quilt out of each of your fsbric lines and homestead gatherings will be no exception. The problem will be narrowing it down to just one – I may have to make them all as I just can” t decide. I love that new feature print too. So cute! Wonderful alphabet quilt. All of your projects are amazing. Love your new line. Do you know how hard it is to find good green prints? Love the ABC quilt – great idea to make it small. Your new line/patterns are so cute – looking forward to them being available. Thanks for the chance to win! Love the Little Alphabet Quilt. Your letter “P” is PERFECT! The new fabric line is very nice. I would love to receive one of your giveaways. It is so good to hear from you. I have missed you. Love the alphabet quilt! I can’t wait to make one. Love everything you design! Thanks for the opportunity to win! Love, love, love your fabrics Lisa and I always look forward to the new lines. The alphabet sampler is so cute. A quilting cruise sounds heavenly! Enjoy! Love you new fabric line and your quilts! Thank you for the chance to win also! Great pics. Although, I love each one of the quilts shown, Homestead just went on my bucket list of quilts to make. What a nice ABC! thanks for the chance! Homestead Gatherings is wonderful – I truly believe there is no place like home and I am blessed to come home to my log house on the lake – so I understand your feelings when you get to the lakehouse! Thank you once more for inspiring the quilter in all of us. I love the new quilts, and the Homestead Gatherings are adorable! Love your mini quilt. Look forward to each new line you put out. I love love love the little alphabet quilt! The fabrics are beautiful as well! The mini alphabet quilt is the BEST and I love the new fabric line. Thanks for all your work and dedication to the quilting world! I love your mini alphabet quilt and other. Love the mini alphabet quilt-so cute!!! Homestead Gatherings line is beautiful Lisa!!! You never fail to please, Lisa. Your new fabric line is fantastic – love the colors. And the quilts are wonderful! And of course I like the mini alphabet – so doable in the small size. Hello Lisa . Your fabric’s are delicious. Your designs is beautiful. Linda, your quilter, is out of this world amazing! I would so much love to win anything from you I would be so honored. Thank you for this opportunity! Hi Lisa, I love the alphabet quilt made in the mini size. Enjoy your cruise. I absolutely love the alphabet quilt. It is so beautiful with all your fabric lines combined. I just have to make it. Can’t wait to see Homestead Gatherings at my local quilt store. Your new line is so pretty – love it. Thanks for the opportunity to win the alpha kit – looks adorable! Love the alphabet quilt and I can’t wait to get some of the new fabric. I am so glad you showed the charm pack with the quilt for size, I LOVE the quilt and want to make one for one of the grands. Really looking forward to seeing Homestead Gathetings “up close and personal”! Love your version of the alphabet quilt! Thanks for the chance! Love the ABC quilt. Have fun on your cruise. Love the new fabric line. Hi Lisa! Your fabric is so Pretty and Perfect for my Patchwork which to me is Priceless and Pleasing and makes me want to Purchase Plenty of your Prints for my Piecing and Patches and endless Possibilities. Although I’m from phrozen Canada, I’m going to Phoenix on Phriday – where do you sell your Phabric there??? What a wonderful ABC quilt! And I love all of the new quilts, too. I’m calling my local quilt shop today to see if they already have the pre-cuts of this new line of fabric – ’cause I NEED more fabric! Thanks for the chance to win and for all the great patterns. Love your new fabric collection – awesome! Thank you also for the generous giveaways. I love your little alphabet quilt. It would be perfect for a baby quilt. I’m also looking forward to seeing your new line of fabric. Those colors look great for holiday quilts. Your Hospitality quilt is stunning. I can’t wait to see the new collection. I’m pretty sure I know where to find the precuts. They’re always prettier in person! I love the alphabet quilt. I have several grandchildren that would love to have one. I hope you enjoy your cruise. The mini alphabet quilt is the perfect size! Love the colorway too. Your store is one of my all-time faves. I just love all your fabric lines, can’t wait to start this new quiltl!! The ABC quilt is wonderful. And the new fabric line is fantastic. Thank you for all you do for the quilting community :-). Your mini alphabet quilt would be so perfect for a child’s room! 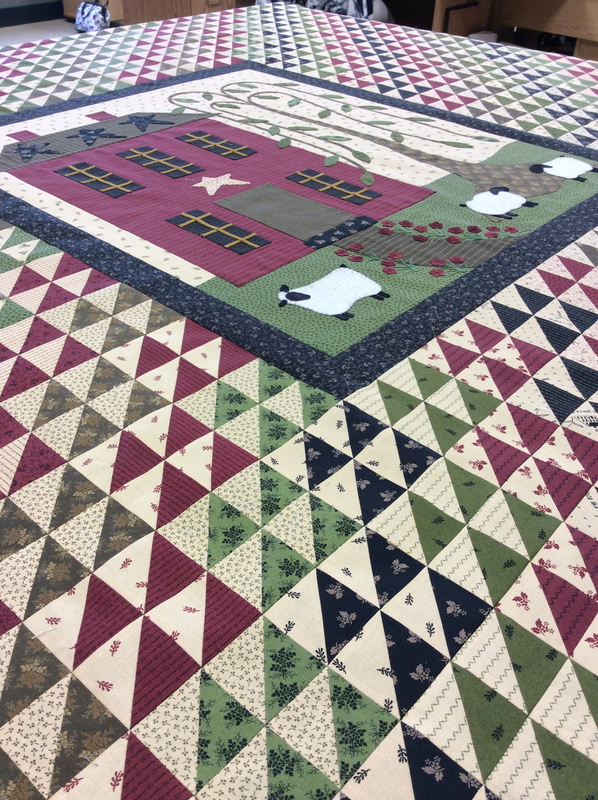 I really love your homestead quilt – beautiful colors and the appliqued house and sheep is wonderful. Have fun on your cruise, and thanks for the give away! your quilts are lovely as is your booth at fairs. Your small quilt is just what I would like to do with these blocks! I think it will be my next charity baby quilt!. Thanks for the great idea and the chance to win your wonderful fabric! Very cool Lisa! Love the idea of shrinking the block size….wonderful idea and so you! The alphabet quilt is so precious….What a great idea for a baby gift!! I may have to order the pattern. I love your post….lots of good stuff. Thanks!! I love the alphabet quilt. I have almost all of the letters. This has been a fun blog hop. Thank you. Love the fabrics and the alphabet quilt! Thank you. This might be a duplicate. Love the quilt and your shop. I love all the “Gatherings” fabrics. The tans are my usual go-to for backgrounds. Thanks for the chance to win the newest. Adorable stuff! Love the new fabrics. That fabric with the little house is just too adorable! Love you alphabet quilt… well done you! Oh my goodness, I love love love the mini alphabet quilt. I can picture your fabric in a quilt with a little country saying at a farmhouse. I love it! Thanks for the great ideas. Love all the quilts and the mini alphabet quilt. Enjoy the cruise. Love the new line! Thanks for the chance to win some of it! As usual your creations are just fabulous! I always enjoy shopping your booth at Houston and look forward to it again this year. Really cute quilt – love the small ones as you can finish those and be proud. More beautiful quilts and love your new line. I love the alphabet quilt. Thanks for the prizes. I love the mini quilt. Thanks for the chance to win some great prizes!! I adore Homestead Gatherings – I think I will use this in you bom pattern Words to Live by. Keep up the good work. I love the spelling of Phifty Shades book, and I agree, everyone should read a great trilogy like that once in awhile !!!! Love all your posts, blogs, fabric and patterns ! You have wonderful ideas and so glad you share them with all of us 🙂 The ABC quilt is adorable !!! I’m a primitive girl so I have always loved your patterns, books, wool, fabric and your store. I don’t know how you do it all so successfully. Thanks for the opportunity to win. The mini alphabet quilt is great. Love love love Hospitality. I want to make this one right away! I LOVE the mini quilt! So cute. I think your mini alphabet is the perfect size. I don’t have a quilt in that color line or style yet so it would be nice to win some of your beautiful fabrics. Thank you! The alphabet quilt is stunning andthe last quilt caught my eye.Fabulous design,quilting and fabrics.Thanks! The new line is really sweet. Love your stuff. I am already looking forward to your booth in Houston-no joke! Thank you for the chance to win. I love the alphabet quilt along with all of your designs..
i love the mini quilt!! For some reason, my eyes were drawn to the sailboat and star blocks in among the alphabet. It really finished everything off! Thank you for all you do for the quilting world. I got two granddaughters last year and have a niece due in April, so this mini quilt is just what we need! I love how you made the quilt smaller and I want to make mine just like it for our granddaughter. Please pick me for your prize so I can make it just like yours :^) Beautiful fabric line. Your fabrics are beautiful and the mini alphabet quilt is so cute. I was in your class in Phoenix for the Needful Things mat. It was so much fun, I love my mat and you are a great teacher. Thanks. Congratulations on your new line. And that little quilt is precious! Love your new fabric line. I love your Mini Alphabet quilt! Thanks for the chance to win! Your new line needs to come my way, so many quilts, not enough time to make all of them! Love the quilt with the sheep and your new line of fabric. Thanks for the giveaway. The smaller alphabet quilt is awesome! Thanks for sharing. Enjoy your cruise! Your mini quilt would be a great gift for a teacher! Love the mini alphabet quilt and I just found out we have another grand baby coming! I love that little alphabet quilt! The ABC quilt would make an adorable baby, toddler quilt. I also love the colors in your new line of fabric. I have taken a class from you before in Brigham City Utah and I must say it was an awesome experience. You are a great teacher!!! Wish I was cruising with you right now!!! Lisa, I lovey our new line of fabric and the three new quilts. Your talent never ceases to amaze me. The smaller alphabet quilt will be a nice gift for my daughter as she is a teacher. Thanks for the giveaway and enjoy your cruise! Love your newest line — another irresistible group! The new quilts are just gorgeous—as is Linda’s quilting!! your designs and fabrics are lovely and warming! I love you new line Homestead Gatherings. Have fun on the cruise ! Beautiful mini alphabet quilt! Your new fabric lines are gorgeous! Your new fabric line is wonderful!! LOVE IT!!! Thanks for the chance to win your very generous give away!! Awesome Blog Hop!! Lias, leave it to you to go up several notches on the alphabet pattern. , love it! Your mind must never stop thinking of new and better ways to enhance our quilting experiences. Have fun cruising! Love this blog hop and your ABC quilt! Thanks for the chance to win. I love the small alphabet quilt,and I always love all of your fabrics. Thanks for sharing. I love the alphabet quilt and being a teacher , I have always wanted to make one! Love the fabrics also! You did a great job on the Alphabet quilt and I love your house appliqué bloc for this new line of fabric. Can’t wait for the fabric to get into stores. Love your new fabric line and the quilts are awesome! I’d love to win something!!! love your fabrics and mini alphabet quilt! All 3 quilts out of the new fabrics are terrific. I just don’t know which to pick!! Love the new line. The alphabet quilt is darling. Serioiusly crushing on those sheep…. thank you for the giveaway! Love your fabrics & kits!! I’m getting ready to book a Caribbean week – woohoo! Hope you have fun on your cruise! So very pretty! The alphabet quilt is adorable and your fabric divine! Beautiful fabrics – love the appliqué with the sheep.Thanks for the chance to win! Really love your down-sized version of the alphabet quilt! Thanks for all your hard work and this opportunity to win! I guess if you are going on a cruise we can give you a break. You sure you don’t want company? Love your alphabet quilt. I love all of your fabrics and designs Lisa. Thanks for the chance to win. Thanks for learning more about you. I love the Gatherings fabric! But I REALLY LOVE this new line…it’s the houses! Your quilts are absolutely beautiful! Thanks so much for the chance to win. I don’t think my first try went thru so here goes again… LOVE your fabric & kits! I’m booking a Caribbean vaca this week, have fun on your cruise! your new fabrics are so sweet especially the one with the house. thanks for the giveaway. Love your fabric and the mini alpha quilt is wonderful. Thank you for the chance to win. Have fun on your trip. would love to toss my seam ripper in the hat and win some of that new line of fabrics! Can’t wait for the patterns to come out! Thanks!! The alphabet quilt would make an adorable baby quilt or a nice gift for a teacher. The new fabric line looks great! Love the downsized ABC quilt, just right for a wall hanging. Thanks for the giveaway. Love the Alphabet quilt….too cute! Lisa; I just love your fabric designs. You are a very talented designer. I also love the mini version of the letters quilt. Thank you very much for the post. It is nice eye candy for the top of the morning! Your mini quilt with the little blocks mixed in is sweet, and the quilts with your new line are gorgeous. Your quilts are beautiful! I would love to win some of your new fabric – the one with the little houses is really cute. Love your new line! The Sheep and House quilt is awesome! I LOVE the new line of fabric!!!! I can’t wait to put some into my own stash. The mini letters quilt is so cute. I can see it hanging in a school classroom. Thank you for sharing your talent. Your work is beautiful. Beautiful quilts and fabrics. Thanks for a chance to win. Awesome alpha quilt and one I would enjoy making, especially with your fabric line!!!! Thanks for the chance to win – I would be a very happy camper!!!! Good Luck Ladies. Thanks, Lisa, for a chance to win. Too Cute…the smaller version Alphabet Quilt with your Moda fabrics is perfect for a child…or a Gramma that uses her quilts to teach children their ABC’s and other lessons. And there is no place like home! P is the perfect letter for you! Love your charming alphabet quilt, as well as all your Homestead Gathering quilts. Enjoy your cruise, sounds relaxing! I love how you did up the alphabets on the quilt and the quilting is perfect, really makes the quilt. Love your new line and have gotten some of the christmas prints too, wonderful designs to work with. Lisa, your creativity knows no bounds. I love the alphabet quilt that you have designed and all the other quilts as well. My grandchildren are home schooled and this would look great in their “classroom”! “P” is for Perfect! Everything you design is simply perfect….thank you for the Perfect giveaway! Well Lisa, you have hit another homerun with that beautiful fabric and I can’t say enough about the quilts….I wish I could just follow you around for a week or two to see how you find your inspiration. You are such a creative and give person. I love the mini size, perfect for baby gifts. Thanks for more inspiration, now I’m off to buy the pattern. Enjoy your trip! Thaanks for the opportunity to win! My favorite letter is P too for both my last names. 🙂 I absolutel love your lttle alphabet quilt…. Love your half size version of the alphabet blocks! You’re fabric’s are fantastic! I love the mini alphabet quilt and, even more, the one with the house and the little sheep. So cute! Love the new fabric and the new quilt designs. Thanks for the chance to win. Have a great trip – relax. Love the mini quilt. Soo cute!! Oh….pick me, pick me!! I just adore that mini quilt and your new fabric line. I would do a whole border in that print with the little houses on it…too cute. Am enjoying the hop, and hope you are enjoying the cruise. The mini alphabet quilt is a great idea – wall hanging for any child’s room! Your fabrics are gorgeous. Thank you for sharing your alphabet quilt. Love what you did with the letters in the small quilt. The quilting on several of the quilts on your site is really fantastic. Sweet mini quilt – love the new fabric line. Thanks for the giveaway. Love how you cut the blocks in half and love your Mini Alphabet Quilt. Your fabrics are always fabulous. Thank you Lisa for the great giveaways! 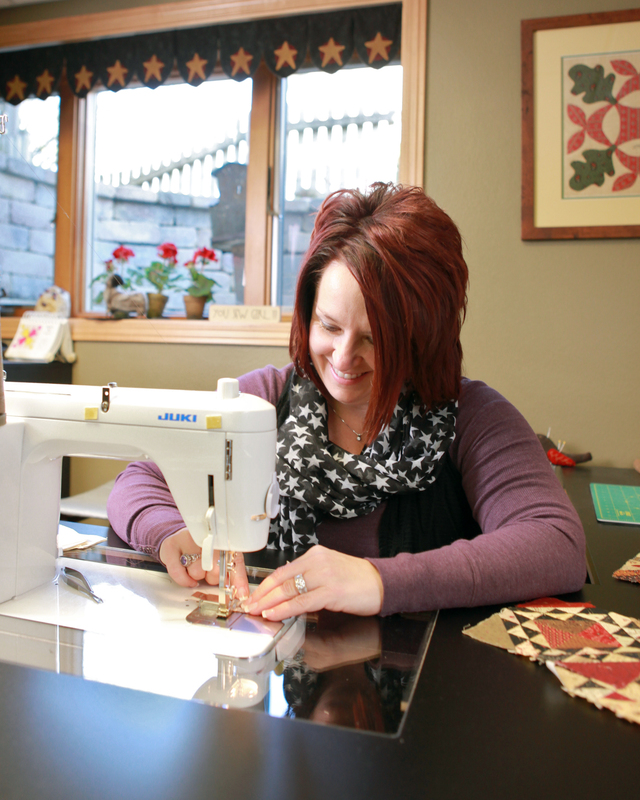 My sewing room is a testament to all the wonderful patterns and fabrics you have designed! Hope you had the chance for lots of sun and fun on your cruise! Your new fabric line is gorgeous – and I agree – I love the print with the house. Definite must-haves for my stash. I love the alphabet quilt. I’m a librarian – so anything with words and letters appeals to me. Your answers cracked me up – Phifty Shades of Gray, Pfat, HA! LOL! Love your fabrics and designs! Impossible to choose a favorite line or design! Keep up the great work! I love your mini quilt version. Guess I will be shopping from your site soon. You are always my favorite booth to visit at the quilt shows. Have fun on your cruise! Great gig! I love the mini ABC quilt! You speak to my heart! Love your designs. I love these fabrics and would love to win! P is important to me because the last name of my husband and kids starts with a “P” (and all my lovely in-laws too!) So the “p” part of my address book is pfat! What a wonderful little quilt!! Also I really enjoy, looking at the new fabric line!! Thanks for a chance to win! I am a Huge fan of your designs and style. I am doing 2 of your block of the months. Thanks for the giveaway. I would love to win! I love the mini version and I love this quilt. Love your patterns and fabric. Thanks for the give away. I love your new fabric, sure hope my LQS has ordered some. I’d love to win. I love your little mini alphabet quilt and your new line of fabrics. Can’t wait to make something with it. Thanks for all your wonderful designs. Thank you for the opportunity to win some of your beautiful fabric. I really like the new designs. Can’t wait to get my hands on some of your new fabric! The hospitality quilt is a must have! Have fun on the cruise. Love the sneak peeks of your new fabric line. Thanks for the chance at the giveaway. Love your alphabet quilt and thanks for the opportunity to win your beautiful fabric! Thanks for the opportunity to win! Your new line looks Pfabulous and I know I will Purchase Plenty in Paducah! Can’t wait for spring. See you soon. I love EVERYTHING you do. Each new item is my newest favorite. The alphabet quilt is just a little gem. Thanks for all your creativity. Since this is my first time to post a comment, I want to say how much I enjoyed the wedding photos. That was a beautiful wedding. I love your fabrics. You do such a beautiful job! The alphabet quilt is just fab! Thanks for the chance to win! and of course so versatile, with your pattern we could spell baby names on quilts too :0). fabric line, Happy Sewing and I wish you continued success. Such a sweet alphabet quilt. And, I have to have some of the new fabric line for sure! Love your mini alphabet quilt! and the opposite piecing, with the color being the background! Thanks for sharing. I love your mini alphabet quilt! especially the way you used the background for the color. Wow — I love the 1/2 size quilt. I was just looking at The Quilted Pineapple blog and saw your wonderful quilt, as she was quilting it. Oh my it is great. Hope I win your great new fabrics. Your new line is cute…love the alphabet quilt. Thanks for the giveaway. Hi Lisa, The alphabet quilt is darling, with wonderful colors. 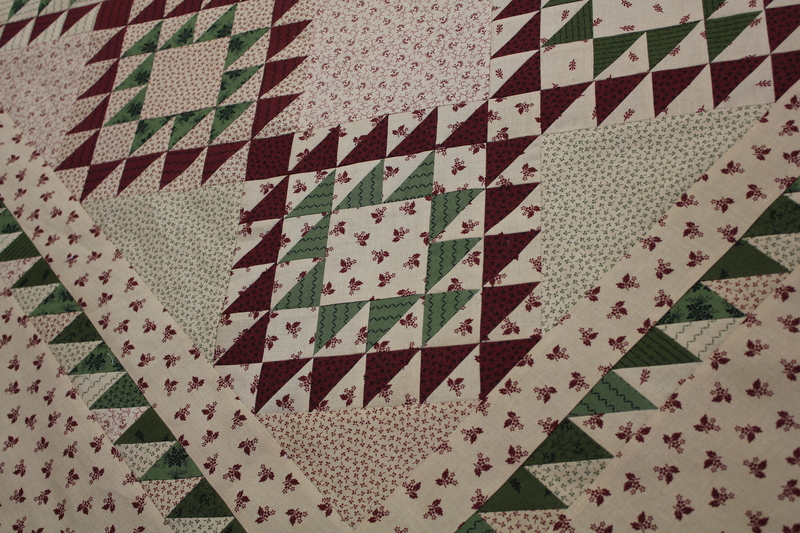 Your new line, Homestead is charming, and I love the quilts, especially “Christmas on the Prairie”. Thank you for sharing! Thinking of you, Chris. I love Homestead Gatherings! Thank you for including me in your giveaway. love your fabrics. can’t wait to add them to my stash. Thank you for doing such a great post while you had so much going on. That mini alphabet quilt is awesome – I’m into making baby quilts for my grandchildren, and that would be perfect! Your Homestead Gatherings fabrics are beautiful… and the little houses with words…darling! watching the video on all the different shops, their fabric line, and what they did with their letter in the alphabet was great. All the fabrics really look bright and colorful. Thanks for the chance to win some of your great fabric! Great little alphabet quilt and thank you for the chance to win some of your pretty fabrics!! The alphabet quilt is adorable. Makes me happy. I love how you did the alphabet quilt with the letter a neutral color and the background different colors. Love the mini alphabet quilt! Just my size! That little alphabet quilt is perfect! I need that pattern, for sure! I saw your new Fabric line on Julie’s blog–the jewelry she made from it is stunning! Every quilt you show here is calling my name. Why aren’t there more hours in a day?!? It was fun to learn a little more about you, my dear. Love the new fabric prints. Will be looking for them. Love your new designs; can’t wait to see them in person. Love your little prints which also work great for finishing my needlework projects. Thanks for the giveaway!! I have to admit that before I saw your post, I also was considering making the blocks half size. I really love your quilt! I’m also coveting your new fabric line. You do such a great job designing! The mini quilt is so darn cute, I may need to make that for a friend who is having a baby. Love all your fabrics and can’t wait to get my hands on the new line. Love everything you design ! 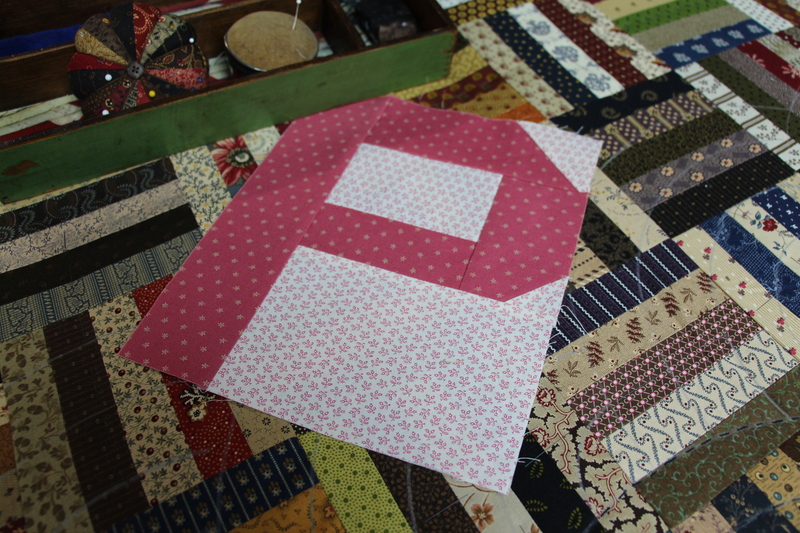 The new fabric line is so cool with those little houses….. Nine patch block is one of my favs also! Love this in the downscaled size. I will for sure be placing an order soon. Will definately be on the make for my grandson list. Thanks Lisa. How I wish I was cruising with you!! Love the little “tease” for Homestead Gathering–I’ll be sure to keep an eye out for when the fabric is available in the stores. Thank you for the alphabet quilt idea. Thank you for participating in the Moda blog hop! Love your new fabric line but then I always love what you do! Thank you! I love the small alphabet quilt! It would be just right for so many places where a big quilt won’t fit. I was so pleased to see your new line of fabric, especially the green! Keep up the good work. Absolutely love the new line of fabric! Love the fabric line and your mini quilt. The alphabet quilt is a great way to remember this blog hop. Love the new collection, the house is so sweet. The mini alphabet quilt is darling! I love your patterns and have stitched up a few. Keep up the creative work! I love everything you do. I am a huge fan!!!! Thank you so much for your products and inspiration!!! That is the best alphabet quilt I have ever seen !!!!! I love it and it will be one for me !!!! Love your designs and fabric – have been a wool customer with you so long and am really loving your fabric…Thanks for all you do !!! I love the alphabet sampler and the quilts are amazing. I love that saying, there’s no place like home, because really, there isn’t. Thank you for introducing yourselves! Really like the looks of the new fabric line…and the quilts you have done up showing it. Can’t for it to arrive in my local shop 🙂 Enjoy the cruise…breaking away from our Midwestern winter would be wonderful!!!!!! I love your mini alphabet quilt-great idea for a baby quilt! Your new fabric line looks great and I absolutely love the new quilt designs! Lovely quilts and beautiful fabrics! Thank you for the opportunity to win some of your lovely fabric! I absolutely LOVE your new pattern! Love this alphabet quilt and I agree there is no place like home. After moving with the military my entire life (as a daughter and then as a wife) we retired and I thought we would stay in the last place forever; until my daughter moved with my 4 grandchildren. We sold the house and bought a new one 3 hours from her and couldn’t be happier. We moved our home to our heart! I just love your fabric so thank you for the opportunity to win a bit! Your alphabet mini quilt is adorable . . . I can’t wait to try one! Love your alphabet quilt…………great giveaway….. I always love things made with your fabric. enjoy your vacation. HELLO, I love your new collection so much! Like all your projects on this post,Oh heck I love all your work!!! I really like the mini letter quilt you made. I also love, love, love the little quilt with the house & sheep. All the quilts shown here are beautiful. Looking forward to seeing the new fabrics at my LQS. Your alphabet quilt is cute. Your new fabric line and quilt kits are amazing! I love the patterns and your fabrics! I LOVE LOVE everything you do!!!!!! Love the little house fabric and the quilt with house and sheep. Great new fabrics! Love how you made the Moda quilt smaller with the darker backgrounds and light letters. Would LOVE to win anything….well especially the kit …hint, hint. Thanks for the chance to win. It’s always so fun to see what you’re working on. Love your newest fabric & can’t wait to get some to play with. Oh how I love primitive quilts and fabrics. You are awesome!!! Love the colors in the mini alphabet quilt and can’t wait for the new fabric line. Love the smaller version of your quilt! Thank you for the chance to win! What a wonderful huge quilt with your fabrics. Such talent. Wish I wasn’t just a beginning quilter. Thanks for the awesome giveaway!! I love the alphabet quilt – can’t decide if I want it for myself, grand daughter, grandson–or all 3 of us!! Beautiful fabrics! Great job “as usual” – love the colors – love the fabric have a great Cruise!!!!!!!!!!!!! I love your little house print! I love you alphabet quilt too. Thanks. Love your mini version! I think I’m going to quilt a phrase once I collect all the letter patterns from teh blog hop so I may need to resize them. I feel in love with your fabrics after I found you on a blog hop way back when…..You certainly do inspire. Hoping to see you in Hampton this week! I love all your fabrics. The little primitive designs are very nostalgic. Looks like another wonderful fabric line. The alphabet quilt would look great in my granddaughter’s room. Your alphabet quilt is so cute……thanks for the chance to win! Love the mini alphabet quilt and your newe fabric. Thank you for the giveaway. Very nice little alphabet quilt. I hope that you had a great time on your cruise! I love your mini version! I love the reds in your new line! And your quilt is to die for! Perfect size for a baby! The mini-alphabet quilt is so sweet. I would love to win some of your goodies! Love your alphabet quilt – I have a little granddaughter it would be perfect for. I love your mini alphabet quilt! Thanks for the fun giveaway. Hoping you are having MUCH fun on your cruise……thank you for sharing during a busy time!! Love the new fabric line, beautiful reds. Also love the mini alphabet quilt. may have to do this one. I love your new fabric line. I’d love to win one of your prizes. My birthday is March 5, so it would be a fun birthday present! I love the Mini-Alphabet quilt….. and all your fabrics! Have a fun time on your cruise. I love the Mini Alphabet quilt…. and all of your fabrics! I love the mini Alphabet quilt….. and all of your fabrics. I love your mini Alphabet quilt…. and all of your fabrics. I love the Mini Alphabet quilt….. and your other fabrics too. I love the Mini Alphabet quilt… so cute! Love the mini alphabet quilt. It would look awesome in a primary classroom. Beautiful quilts in this post! I got some Homestead Gatherings precuts a couple of weeks ago, and I can’t wait to use them. I need to get more before it’s all gone. I especially love the “no place like home” fabric. Thanks for the chance to win and hope the cruise went well! I love the half size alphabet quilt you made. It is so cute in your fabric collection. I love what you did with the mini letters. Perfect size for a baby quilt. Have fun on your cruise! I love the mini alphabet quilt. I’d like to try making that with your fabrics. Thanks for the inspiration. I love your designs. Saw your booth at the Road to CA and fell in love. “No place like home” is so true! Love the fabric! Thank you! Lisa, beautiful new “gatherings”. Amanda gave me a fat 8th bundle of the “floral” gatherings shirtings, now must think of a combo project to use both the newest and the bundle. Coming down in March, can’t wait!! Love Love Love the mini alphabet quilt! I need to make one for my new nephew!!! I really love what you made with the letters. What a cute little quilt. Your fabrics are so pretty. I really like the reddish/almost deep dark pinkish color against the greens. Very nice. Love the new fabric line!!! Linda is such an inspiration and I hope one day to be half a good a quilter as she is. Keep designing Lisa and remember every day is a gift. Beautiful quilt! Have fun on the cruise, thanks for the chance to win. I really love your traditional colors and prints, as well as your pinwheel templates. Love your new fabric. What a coincidence hat my doorbell plays “There’s no place like home.” Thanks for the chance to win you giveaway. That’s an adorable alphabet quilt. I also love the colours in your new fabric range, they are not colours I use often but maybe I should start. Thanks for the chance of winning something. This is definitely my new favorite line. I didn’t think you could top snowman gatherings-but I think you did! Another moda line that I absolutely love. You have drop dead beautiful quilts. If I lived close to your shop I would quit my day job and park myself on your shop steps until you hired me. Love the little alphabet quilt! It’s so cute! I love the alphabet quilt–perfect for my granddaughters! I have some of Lisa’s fabrics and love them all. So glad there is a new line! Adore the new fabrics….you are making me WANT to shop and my DH will NOT be happy….giggle. WOW! Great fabrics! Love anything done in a small version and already had in mind to shrink the blocks down a bit. Not sure how I’m going to lay them out yet, but figuring it out is the fun part of the quilting process for me. The mini quilt is wonderful!! The mini alphabet is as sweet as can be. And, of course, the newest fabrics will be fun to work with. Love the smaller size! Great new fabric! I love the mini quilt and your beautiful fabric! I hope you are enjoying the cruise! I’m enjoying the new line! I’m having fun with the alphabet. A quilting cruise is on my bucket list. I can’t think of anything better! My hubby, not so much! Such a cute quilt and I love your newest line, the colors are luscious as always. Thanks. I love your work. Looking forward to seeing and buying the new fabrics at my lqs. 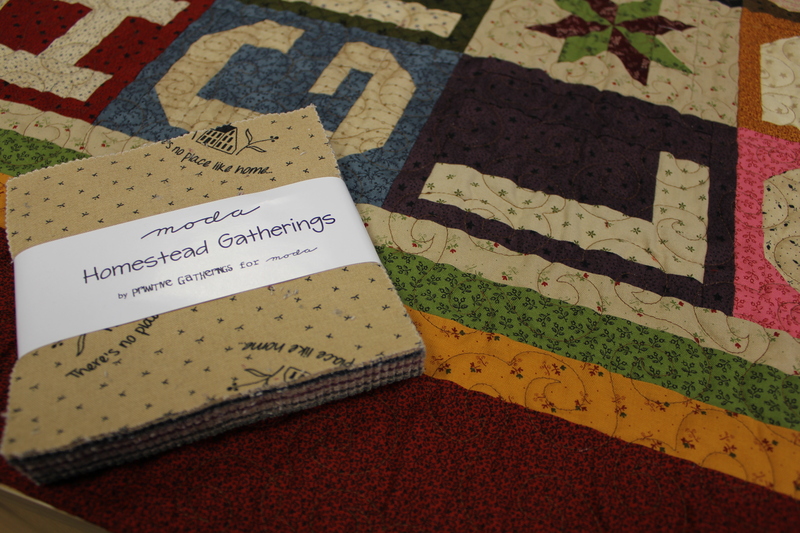 Lisa, I absolutely love your Mini Alphabet quilt and Homestead Gatherings is gorgeous!! I love the colors and the house print is my favorite! Thank you for sharing and I hope you have a wonderful cruise! Love everything you do Lisa… It’s all amazing! I love the mini alphabet quilt….great for a classroom or a kid’s room. Lovely fabrics …..Thanks. The mini Alphabet Quilt is so cute…I have 3 young grandsons..would make a great quilt for one or all of them! Think of all us quilters in the snowbelt while you are cruising!! I think any of your lines pair up nicely with anything – love them! I do have a charm pack now and deciding on yardage, I like getting them ahead to drool over and plan what my next project will be. Thanks bunches! Your mini-quilt is so cute – thanks for sharing & thanks for the chance to win. Love the mini alpha quilt and thanks for the chance to win!! Love the quilt with a all the letters, greats lines of fabric to use. Have a blast on the cruise! Love love love your new fabric line, the little hearts coming out of the chimney , how cute is that. I’m in the middle of making a black and white quilt, so am pleased to see the black fabrics in this new line. I love alphabet samplers. Can’t wait to make a pieced and quilted one. Love your fabric line and those gorgeous quilts. Love the mini quilt and your new fabric line. Love the mini quilt and the tan/red “there’s no place like home” fabric…perfect! I love the mini alphabet quilt, and all your fabrics. Thanks for the chance to win. Love the idea of a scaled down version! What a great gift for a new baby! Love the smaller ABC quilt. I am going to be a new grandmother in April. So perfect timing. Thank you for the chance to win. I love the alphabet quilt, it is so cute and perfect. Love all the little prints in your fabric. you have some amazing quilts! Your little alphabet quilt is so stinkin’ cute!!! So fun! You and your staff are amazing. Everything you create is just beautiful. My husband is very glad that we do not live close to Wisconsin. Your new fabric is wonderful. We are expecting our 8th grandchild in August so your alphabet quilt would be perfect. I will cross my fingers that I will win the pattern! Thank you for the opportunity to win. Enjoy the cruise! I love your alphabet quilt! My favorite fabric of yours is primative snowman. I bought the stuff to make the quilt. Now to get started!! Hope your trip was great. Those fabrics are yummy! I can’t hardly wait to get my hands on some of them. I’m into smallish HST right now and I love that quilt with all of those in it. I have to agree with Cindy, you are a whirl wind Lisa! My favorite line so far has been little gatherings and I’m hoping to pick up some at the shop at the end of March…thanks for that chance and keep up the great work! Love all your fabric lines, especially the deep reds. Thanks so much for the chance to win! Your new fabric line looks gorgeous. Thank you for the opportunity to win somethings. As always your designs are just the Best! I need to start seriously saving some $$ so I can get a couple of your kits – Beautiful!!!! Your mini alphabet quilt is awesome! Once I collect all the letters I’m going to make one for my grandkids. Thanks for the chance to win some of your gorgeous fabric! I love the mini alphabet quilt. Phanks! Love your new Phabric. Another wonderful fabric line! I guess I had better start making room on the shelf for some of this. Can’t wait to see this fabric in person. Thank you for the chance to win. Great alphabet quilt, Lisa! Love your alphabet quilt. I don’t have a young grandchild, but I think I need to make it anyway. Thanks for a chance to win some of this yummy fabric. Sure wish I could go on a cruise – I bet it would be fun to cruise with fabric in hand! Love the ABC quilt! Will have to make one for my daughter’s classroom. She is a kindergarten teacher. And hopefully for a grandchild soon. Thanks! The quilts displayed are beautiful! Love them! Beautiful new line of fabric! And I love what you did with the alphabet–what a great baby gift it would make! The colors in the Homestead Gatherings line are wonderful! I also like the Homestead pattern very much. Thank you! Love all of your quilts. Today I am in love with Homestead. Love all the Primitive Gatherings fabrics, and have FQ’s and charm packs of all of them so far… Eagerly waiting for Homestead Gatherings to be available! Love your new fabrics. Thanks for the great giveaways. Beautiful fabrics & love the ABC quilt! Thanks for the chance to win. I love your new line of fabric and the cute alphabet quilt! thanks! I love your cute little alphabet quilt! Have a grand baby on the way….might have to “steal” your idea. Love the new fabrics too, especially the one with the little house. Thanks! Thanks for sharing the cute quilts and thanks for the great giveaway. Thanks for your beautiful primitive fabrics and for the chance to win! An alphabet quilt is always a lovely quilt for a child. Thanks for sharing yours. Love your quilt. It’s very pretty. Your quilts are lovely. I especially like your little alphabet quilt. Love the deep colors in your new collection. I am a sucker for cream, red and green quilts. Love, love, love ALL the Gatherings fabrics. Love all your designs and LOVE the ABC quilt! I love all of your fabric lines but the new one is wonderful! ! ! The little alphabet quilt is so cute, love it too. Thanks for a chance to win. I love the little quilt -it’s just the right size! Can’t wait to see the rest of the new fabric line – I really like the little houses. I just love that mini quilt. So cute! I never thought about making it smaller like that. Thanks for the great giveaway; and I love your fabrics! Love the Mimi alphabet quilt… Perfect as a baby quilt!! Your fabrics are gorgeous too!! Beautiful!! Thanks for the chance to win! The mini quilt is adorable. What awesome prizes, I love your fabrics!! The quilting of Linda’s is always some of the best too. So perfect for your quilts and so inspirational. Love that! Love the mini Alphabet Quilt. It’s a nice size and love the colors. My 4 yo Granddaughter would love it. Maybe Gramma can make one. Love your new fabrics. Thanks for a chance to win some. Love your little red houses and the sweet saying. Even after a fab cruise, there just is no place like home, is there! Love the idea of using the alpha letters in a mini quilt! Thanks for the giveaway! I honestly love all of your “Gatherings” fabrics. They jusy seem so home-y to me. Hope you enjoyed the cruise! Your HST are fabulous! Thanks for the chance to win and try some with your fabric! Love the little alphabet quilt and the new fabric line. Can’t help but wonder what the next ‘gatherings’ will be? Hope you are enjoying the cruise! The alphabet quilt is nice but I LOVE the quilt with the sheep! Thank you for sharing a bit about yourself, love that you are teaching on a cruise. I hope to go on a cruise someday. I really love your fabrics, and the alphabet quilt you designed is so cute. The alphabet quilt is really cute. Love the fabric too. I love the Hospitality quilt pattern but I’m also really into half square triangles right now! Your little alphabet quilt is adorable and it is fun to see it in the setting of your shop. I love the mini ABC quilt! It’s so precious! Would love to win! Thanks for hosting! I love your fabric and the Alphabet quilt. Am loving your new fabric line. Can’t wait to get my hands on it. That mini alphabet quilt is just adorable! Love the mini alphabet quilt and also your new line of fabrics and patterns. Think I will need one of everything. Thanks for all you do for us. Ooo I love your new line Homestead! Can’t wait to get out there and purchase some 🙂 Thank you for the opportunity to win! I positively love the mini-alphabet quilt! It’s so precious, and the fabrics are very pretty! Thanks for the chance at some awesome give-aways!! Love your new collection and quilts. I absolutely love your new Homestead quilt and fabric. Thanks for the chance to win! Thanks for the chance to win – love your mini-quilt! Love the new line of fabrics. Cant wait to see whats next. Your quilts are awesome, thanks for sharing! Love, love love all your mini print fabrics!! They are my absolute favs!! It would really make my day to win some. Thanks for the opportunity to do so! Love your new line Homestead Gatherings. Thanks for the chance to win! If I dont win, I will be at the Quilt Expo in Cleveland in April and buy some then. Beautiful quilts and thanks for sharing such a wonderful giveaway!! I love your site and blog. Have a glorious time on your cruise! Looking forward to Homestead Gatherings! love your new line and your cute small quilt! Thanks for a chance to win! I love your mini quilt! Really enjoy your Gatherings collections of fabrics. Small prints are also great for doll clothes in addition to quilts! I love the mini alphabet quilt and can’t wait for your new line “Homestead Gatherings” to be out. Thanks for a chance to win. I am having so much fun following the Alphabet but I’ve been following your blog as well. Hope your cruise is more fun than work! Love all of your fabrics and your lakehouse! The alphabet quilt is cute. Thanks for sharing. Beautiful fabric! Love the mini quilt! Thanks for a great giveaway. I love the small alphabet quilt. Your new fabrics are beautiful as always. Thanks for the contest. Love the fabrics and the mini quilt. Hope you have a wonderful cruise quilting at sea! There is no end to your creative talent! Love the new line! Particularly love the words under the houses! Would love to win your alphabet kit! Everything’s coming up alphabets for me! Love your new quilt and kit with my favorite gatherings fabrics! Love your new line and there really is no place like home! I can see all of these new quilts in my future! I love your mini alphabet quilt and your new quilts and fabric is gorgeous. I’ve always wanted to do an alphabet quilt for a child; love yours! Thanks for sharing and for the chance at you wonderful giveaway. I love the little alphabet quilt. It is Perfect!! My grandies would love your little quilt! Love the new fabrics! This new line is gorgeous! Love the scaled down alphabet quilt too! Love the alphabet mini quilt! Love your quilt, too gorgeous! Your new line of fabric is also adorable! Love the “P” for Primitive….only thing missing is the “A” for Antique. Ooooo, I feel an antique, primitive quilt in my future. Love the house quilt! The new fabric line looks beautiful – so many possibilities! Once again you’ve created a project I NEED to add to my wish list! Your creative eye is always an inspiration. What a sweet project! Love your work. My girls are both elementary teachers. The small quilt would be a terrific idea for them. Unfortunately, all 9 grandchildren are now in junior high or high school or in college. Can you even imagine the look I would get from them??? Scary. What a wonderful little quilt. I’ve ordered my pattern. Maybe I’ll get lucky and win some fabric to go with it! Thanks for sharing..
Love the new fabric line! Thank you for a chance to win some of your fabrics, I am currently working on Lisa’s Garden and love it! Looking forward to seeing your new line! And what a darling alphabet quilt! That Hospitality quilt is just gorgeous! Thanks for sharing your Alphabet Quilt, I would so love to win that prize! Your designs are wonderful! And comforting. Your house fabric is sooooo adorable! I am already coming up with some ideas for it! Your half size alphabet is very creative! I do like the smaller size! Love the mini alphabet quilt!! Thanks for sharing! Phifty?? lol Love that. The border for Homestead is wonderful! I love the way it looks. Great fabrics and really awesome quilting on the last quilt. Have a great cruise! Thanks. The alphabet quilt is sooooo cute!!! I may have to make one. Look forward to your new line. Have fun with the curise. I would love to run away from this cold weather we are having. I so enjoyed your booth at the Columbus, Ohio quilt show. The alphabet quilt is adorable! Cruises are great and hope you enjoy it alot. Love your fabrics and patterns. I love this collection – classic but homey, what a winner! Thanks for the giveaway and enjoy cruising! I like how you did the ABC quilt in a reduced size. And I like how you keep to the older patterns but update them in fabric selections. I love your mini quilt the fabric really makes it stand out. I’ve liked all your previous lines of fabric and this new line is even better. I look forward to using it to make some scrappy blocks. Lisa, A cruise sounds like a fabulous treat this time of year. Would love to play with your new fabrics. I love your Homestead Gathering line and the quilts you have made with them. I’ll definitely be looking for it in my local quilt shop. Your Hospitality quilt is a must have for me, beautiful!! That mini alphabet quilt is just too cute!! Your fabric is awesome! I have always loved primitive and folk art. Your eye candy is always wonderful! Totally love your little mini quilt! Also your new line is totally delicious! As always, all your “stuff” rocks! But I have a thing for both HST’s and sheep … a new item on my wish list! As always, love, love, love, the fabric line and the HST’s and the primitive house and sheep! I love all the blocks everyone has made. This is a great hop! These blog hops are so fun! Even though you are probably having more fun on a cruise! Woohoo! Love your new line of fabric, I will be looking for it in my local shops! Love your little quilt! It would be sew sweet hanging in my classroom. How fun is your Alphabet Quilt! ! I really enjoy all your designs. Happy Sewing! Very fun, I sure would like to win! Just love the mini quilt..as a newly retired teacher, alphabet quilts hold a special place in my heart. Your new fabric range is beautiful! Thank you so much for the chance to win. I would enjoy the opportunity to design a quilt with your fabrics. Great small quilt and beautiful fabrics! HOME is the best place to be! I love the alphabet quilt! The fabric is perfect. I would love to make this for a special someone! I absolutely LOVE the mini alphabet quilt. I just may have to breakdown and order that kit. It’s adorable. Thanks for the chance to win. Oh, I am in love with the mini alphabet quilt. Also, I am drooling over the Homestead quilt and your new fabrics! Yummy! I have the same You Sew Girl sign in my sewing room. It always makes me smile. Thanks for the chance to win. I really like the mini alpha quilt. I love your smaller version of the letters. Thanks for a chance to win. Love the alphabet quilt! What beautiful fabrics! Thanks so much for the give-away! Love your fabric! Cute quilt! I love the colors and prints in your new collection. Thanks for the sneak peak and for the giveaway. Your mini quilt is adorable! Love the little feature blocks! I like the alphabet wall hanging. Perfect size! Beautiful Quilts! 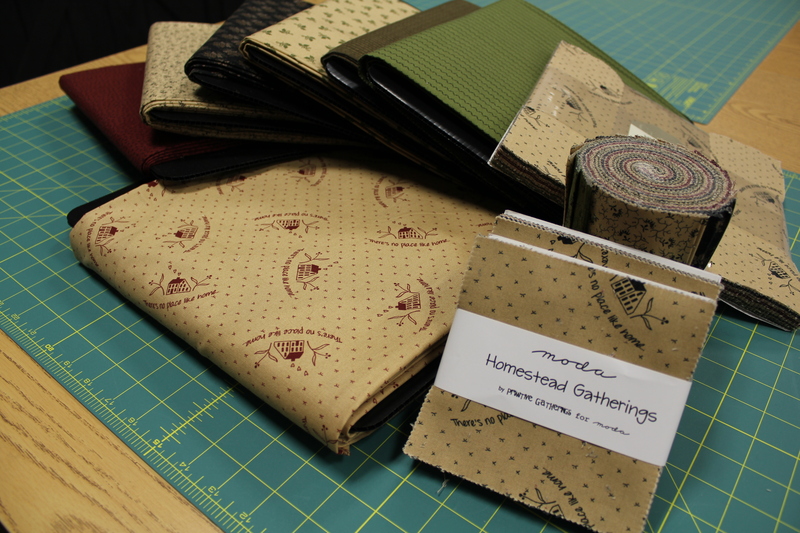 I am very excited for the new Homestead Gatherings fabric and can’t wait for it to be used. Love the post and this blog hop. Love everything! Especially your sheep!!!!! I love your ABC quilt 😉 I know one of my girls, who has 4 children, would love to have me make this quilt so that she can hang in her house, for the kids! Moda is just about the only fabric that I buy. Everything is so beautiful-love it all! Lisa, your mini quilt is fabulous!! Enjoy your cruise. Perfect little blocks! And love the new fabric line – nice to have light fabrics available. Thank you for the chance to win! Your quilts are always so pretty. Love your blog. I love that little alphabet quilt! Such a great idea! I love the mini quilt! So clever! Ahh…lucky you, on a cruise! I wish I was with you – I’ll have to look into these quilting cruises! Thank you for sharing your newest collection with us! Happy to find you through your letter P, almost got lost looking around, so much to see. I will be back. Thank you for what you do. Hmm – somehow I have a wordpress account – better to contact me using this information if I’m lucky enough to have my name picked! I think your mini quilt is great. I will be buying the pattern. Also wining your fabrics and making a quilt is something I would love to do. Thanks for the great fabric also. I love that accent fabric too – such a true sentiment and in my favourite quilting colours of red and tan. I dream about visiting your shop one day – it looks delightful – but I live in Australia so I have to just dream and get my fix off your blogs. I really like the bottom quilt. I love your new line of fabric and the quilts you have made with it. Love the alphabet quilt. Going to get my self a kit! Thanks for the chance to win. Hope you are enjoying your cruise! Really like the new fabric line. Have been looking forward to this blog hop. Love the alphabet quilt made with your lines……….just might have to order that kit!! Your work continues to inspire us. Love the small alphabet quilt! The cruise sounds like a ton of fun! Thx for the beautiful new fabric! Another adorable quilt . It really looks nice and the size is perfect. And the kit is tempting!! Hope you had a wonderful time on the cruise! Totally agree with “There’s no place liked home”! I love your shop and all your fabric and patterns! I stop there every time I am in Wisconsin, which isn’t as often as I would like. The little alphabet quilt will be perfect for my grand niece. Thanks for the giveaway. I would love to win! I love the new quilts with your new line. I agree, the quilting is fabulous. I really like quilts with open spaces where there is room for beautiful quilting. Thanks for a chance. Your mini quilt is adorable! Homestead Gathering is just another one of your beautiful lines … love them all … have purchased them all … keep them coming … BEAUTIFUL!! Love your mini alpha-bet quilt and the hospitality pattern! I love the fabrics and the little letters! I truly love the colours of your new fabric line. I would love to make a wall hanging with them-it would look lovely on the log walls in my house. HOpe you’re enjoying your cruise. I absolutely am loving your alphabet quilt pattern mixing in the blocks along with the letters!!! I just adore your little alphabet quilt. This would look so cute on a nursery wall. Thank you for all the inspiration you share with us. Can’t wait to see your newest fabric line. Really like the Lisa version of the alphabet quilt AND the fabrics used. Thanks for the opportunity to win. Your new fabric line is amazing. Thanks for the chance to win some of it! Such a cute quilt. I love your new fabric line. Cute fabric! Cute designs! Thanks for the chance to win! Love the alphabet quilt. Your new line is great and I’m hoping to see it in Lancaster. The mini alphabet quilt is cute! Would also be sweet in full size. Beautiful new fabric line! Thanks for the pattern and the chance to win. Love, love, LOVE your alpha quilt! Cutting the size in half is genious. This might have to be the next quilt on my list. It would be an absolutely adorable baby gift. Thanks! Your alphabet mini is darling, I couldn’t wait to see you at the next show to get the kit. Can’t wait to receive mine. I’ve never made an alphabet quilt either. Yours looks like a lovely way to get started. Thanks for the chance to win. Of course you made it smaller! I love it! My favorite little alphabet quilt yet.Those new quilts are absolutely gorgeous. Thanks for all you do! As always love the new fabric. Thanks for the chance to win some wonderful prizes. Love your patterns and fabric always look forward to seeing your new designs. Your fabric design is beautiful. So nice and “homey”. The alphabet quilt is a great design. Thank you for the giveaway. Love the little alphabet quilt and your fabrics are beautiful! Thanks for the chance to win! Beautiful quilt! Thanks for the chance for the giveaway!